United get their Tom-Henning-Ovrebo moment. We all watched the Real-United game last night and there’s no need to recap the events and go into the nitty-gritty of the law. 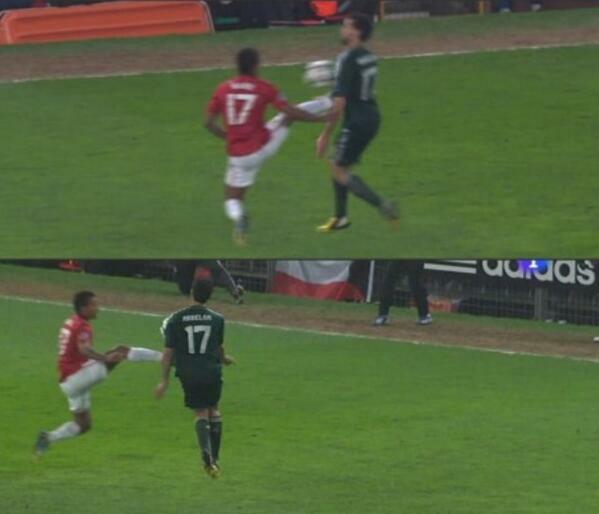 Personally, I believe Nani deserved an orange card at the very most. But then again, RVP didn’t deserve that red at Camp Nou a couple of years ago. Fernando Torres didn’t deserve that red (against United, no less), earlier this season at Stamford Bridge. If I remember correctly, United fans defended the Torres, card vehemently. I bring this up because Nani’s and Torres’ cards are similar; correct to the letter of the law; but the referee could have taken the occasion into account and been sensible. I heard a commentator say that Nani's red card was the most shocking he'd ever seen. I must say that's the most shockingly biased commentary I've ever heard. Shaun Derry was sent off for the simple crime of his body being in the way of Ashley Young's fingers as the latter dived to win United a penalty against QPR. Torres was sent off for going down under the challenge of a United player despite the fact that he already had a yellow. There's patriotism and then there's BS. NB: UEFA must punish Fergie, Ferdinand and any other players who emulated their self entitled manager in harassing the officials. Just like Chelsea’s players were punished after the Ovrebo incident in 2009. No exceptions. “Independent of the referee’s decisions, the best team lost”, a very somber Mourinho said. This is a statement that is so anti-Jose it could be classified as an oxy-moron. Yet Jose is a very calculating man. Due to his nomadic and belligerent ways, he is fast running out of clubs to manage. As things stand, his job options are; Chelsea, United and City (I rule out PSG because the Ligue 1 doesn’t match his ambition). I get the feeling Jose finally wants to settle down and build a dynasty. Chelsea is Mourinho's spiritual home but Abramovich hires and fires like he’s voting on Idols. There’s a very realistic possibility that Mourinho could be seated in Fergie’s seat in the next decade; and he didn’t want to jeopardize that by angering United fans. Rafa Benitez has provided a very important lesson here. Speaking of which, “best league in the world”, my foot!! Ø Champions elect, Man United so feared getting ran over by Real that they opted to sit deep and play on the counter, at Old Trafford!! It was tactical genius yes, but it was also pragmatism. If United engaged Real as they do the likes of Spurs or Liverpool, they’d have been obliterated. Ø Reigning champions, Man City crashed out in the group stages. They collected 2 points, won 0 games and scored as many goals as Oscar. Ø In terms of head-to-head, Chelsea were only better than Nordsjallen, in their group. Also, first defending champions to crash out in the first round. Basically just because a certain league is the most widely watched in the world, doesn’t mean it’s the best, just the most popular. It’s basically like saying Justin Bieber is a better musician than (*insert name of any decent musician here*), just because he is more popular than (*name you inserted*). Don’t believe the hype. I’d like to state that from what I’ve witnessed so far, barring the usual football unpredictability, this year’s European crown is going to Germany. Bayern are the favorites of course. And I don’t base this on the footballing lesson they gave Arsenal because everyone but AW saw that coming; but on the consistency of the Leviathan they have assembled in Bavaria this season, coupled with their anger at Chelsea’s near Charlatan-like theft of the trophy at the Allianz Arena last season. Borrussia Dortmund, I’d think, would be second favorites ahead of Madrid and Juventus. If you haven’t watched at least three BvB games, I recommend you do. The fluidity of their football, the guile, craft and link up play of Mario Goetze, Robert Lewandowski and Marco Reus, the defensive solidity of Mats Hummels and Neven Subotic, not to mention Lewa’s eye for goal.. Yesterday, I witnessed Dortmund crush Shaktar Donestk(a club that still gives holders Chelsea nightmares) like a bug under their boot. The effortlessness with which they did it was ominous If they can avoid Bayern until the final, they could be shock winners to many people. Lewa, Goetze and Reus; Deadly trio. I put BvB ahead of Madrid because of the unity and stability in the squad that has eluded Real this season as has been widely reported. Also, going by the two teams group stage meetings and Madrid’s relatively limp displays against United, I’d say BvB has the edge here. Juventus are the dark horses but their lack of a world class striker has them severely hamstrung. Had they managed to get Fernando Llorente in Janaury, they'd be serious favorites. For you betting men, BvB’s odds to win it all are at 10-1. Thank me later. 'Am so distraught to comment here', but clearly the unwritten law of UCL is 'upsets will not occur consecutively/ twice to the same team in the final' the exception being your current bwoy: Rafa's (2001) / Hector's (2000)Valencia. So Bayern may get this grail on the second asking.